What’s Your Favorite Leftover Thanksgiving Recipe? If you’re not out shopping for all of the Black Friday deals available today, then you’re probably standing in your kitchen wondering what to do with all of those delicious Thanksgiving leftovers. 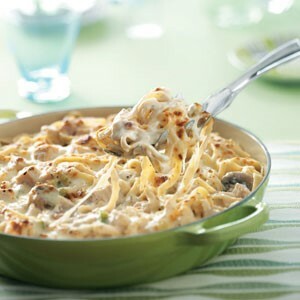 There are tons of holiday leftover recipes out there, but I was looking for something new and a little bit different, and this Turkey Fettuccine Skillet recipe fits perfectly and utilizes many of the ingredients most of us already have on hand due to the holiday cooking season. What are some of your favorite leftover Thanksgiving recipes? TOTAL TIME: Prep: 10 min. Cook: 30 min. 1 cup: 361 calories, 7g fat (3g saturated fat), 76mg cholesterol, 343mg sodium, 38g carbohydrate (8g sugars, 2g fiber), 34g protein. Diabetic Exchanges: 4 lean meat, 2-1/2 starch, 1/2 fat. Cook fettuccine according to package directions. Meanwhile, in a large ovenproof skillet coated with cooking spray, saute the onion, celery and garlic in oil for 3 minutes. Add mushrooms; cook and stir until vegetables are tender. Stir in the milk, seasoning blend and salt. Bring to a boil. Combine cornstarch and half-and-half until smooth; stir into skillet. Cook and stir for 2 minutes or until thickened and bubbly. Stir in Parmesan cheese just until melted. Stir in turkey. Drain fettuccine; add to turkey mixture. Heat through. Sprinkle with mozzarella cheese. Broil 4-6 in. from the heat for 2-3 minutes or until cheese is melted. Yield: 6 servings. May also substitute smoked turkey legs, chicken, ham or other protein of your choice. If you prefer a bolder taste, consider switching out the mozzarella for strong cheddar or white cheddar. Or butter for the canola oil. Also adding in generous amounts of ingredients such as white pepper, cayenne, fresh parsley, baby portobello mushrooms or panko crumbs on top will also add a great punch of flavor.